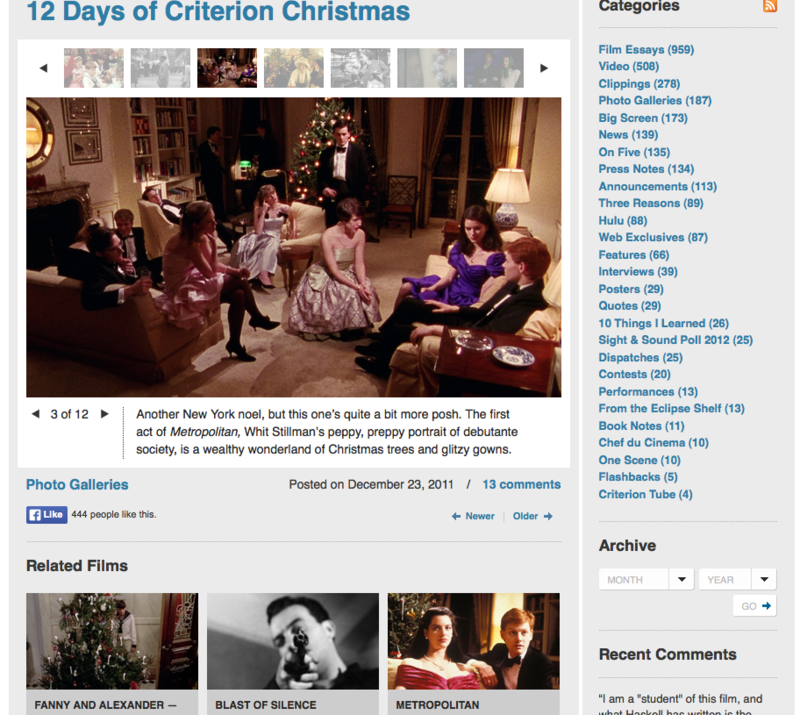 From Christmas past comes an article from Criterion and Whit Stillman’s Metropolitan is listed among the great Criterion films that deal with Christmas. Grab some egg nog and put it in the DVD tray or Netflix instant watch. Or you could be sad sack and watch the Yule Log. CRITERION HAS BROUGHT out two director-approved Blu-rays of Whit Stillman’s independent films. The two films mostly comment on upper class young adults, in and around their milieu, much of it based on Stillman’s own experiences in New York City. Stillman succeeds at poking fun at many of his subjects, but understandably does it with a hint of recognition and plenty of sympathy. It’s no accident that two of his characters in “Metropolitan” bicker about the value of Jane Austen novels, as both films are modern-day comedies of manners, focused on the privileged class as well as some wannabes. The Last Days of Disco, will be released on Criterion Blu-ray July 24, 2012. The details are available on dvdtalk and it’s available to purchase on amazon.